The upcoming total lunar eclipse of Wednesday, 31st January 2018 is on a blue moon, because in some parts of the world this is the second full moon of January. 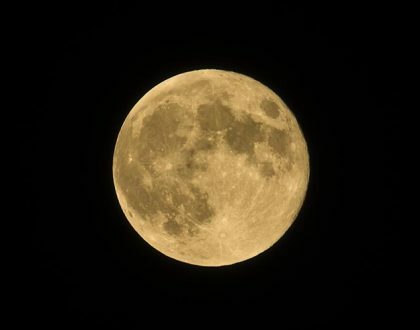 Moreover the full moon also happens to be a super moon and will look bigger and brighter due to its perigee position with respect to Earth. A total lunar eclipse is often called a blood moon because of the reddish orange glow the moon exhibits during the eclipse. Therefore this eclipse is being called the Super Blue Blood Moon Eclipse. The exact time period of this eclipse will depend upon the latitude and longitude of your location. While it is visible in North America, Australasia and Asia, the eclipse is not visible in much of Western Europe, except in Scandinavia. The eclipse is also not visible in the majority of South America and Africa. You may determine the nature, extent, and time duration of the eclipse relevant to your location using the above link. In general, eclipses indicate an interruption of the energy of the luminaries and hence are deemed as important events for life on Earth. An eclipse affects all plants and trees especially those on land receiving the sunlight and moonlight directly. Living creatures such as birds, mammals, reptiles, amphibians and even insects have been seen harnessing the power of these transitional events. One such recorded event of eclipse awareness from the animal world is shared herein. 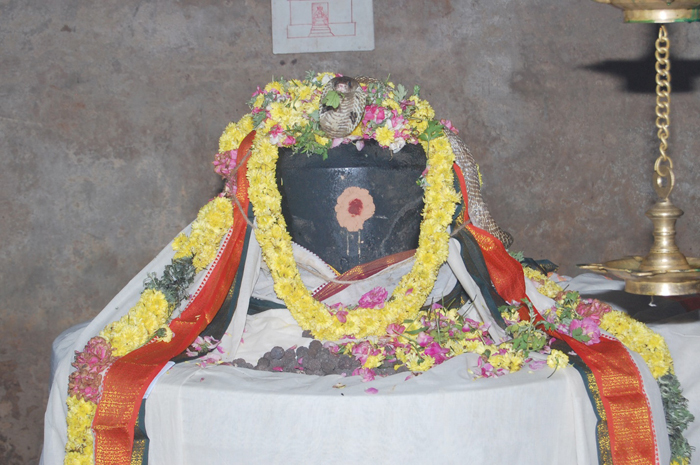 During the morning solar eclipse of 15th January 2010 several devotees witnessed a cobra worshipping an altar (Śivalingam) using sacred wood apple leaves (bilwa). 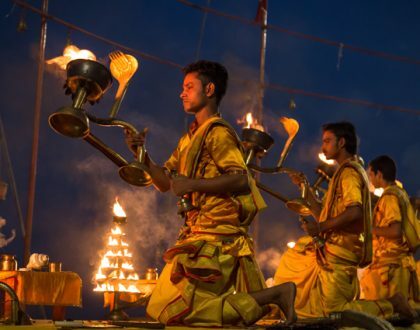 This special worship took place at the Thepperumanallur temple of Viśvanāthaswamī (Śivaḥ) near the city of Kumbhakonam in the southern state of Tamil Nadu, India and was recorded by a photographer named Thenappan. The photographer was called in by the priest during the midmorning when he noticed the cobra mounted on the altar. The cobra was then witnessed dismounting the altar just before the start of the eclipse, fetching the sacred stalk of leaves from the temple’s wood apple tree and re-entering the sanctum sanctorum, remounting the altar, opening its hood and thereafter offering the leaves on top of the altar. By that time the eclipse had started. The sequence was repeated by the cobra as if in a worship gesture of expiation. Each stalk has three leaves symbolizing the two eyes and the third eye of timelessness, constituting a perfect natural offering to Śivaḥ who is hailed as the Lord of Time. Residents of the Thepperumanallur village say that serpents had been visiting the altar during at least three previous solar eclipses. The priest and local devotees of this temple had thereby prearranged for the photographer to record this event in expectation of a similar interaction. The recorded worship by the cobra demonstrates how creatures are aware of the timing of an eclipse and prepare for such special moments. 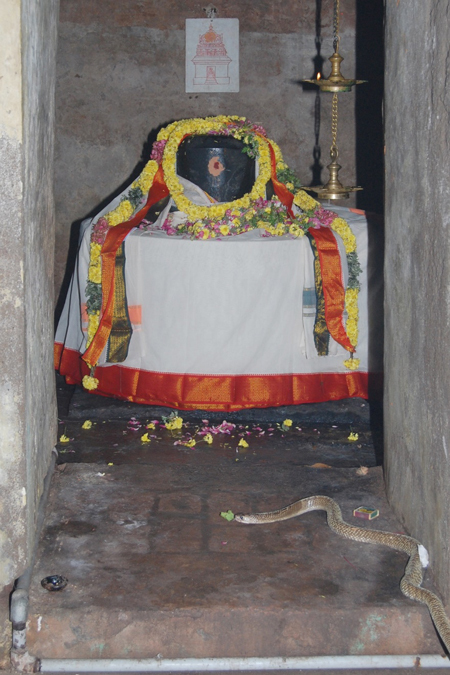 Cobra entering the sanctum sanctorum with the leaves held in its mouth. Image by Thenappan. Cobra approaching the altar with the single stalk of three leaves. Image by Thenappan. Cobra mounted on the altar with its hood open, ready to offer the sacred leaves. Image by Thenappan. While animals seem to be attuned to the forces of nature and better informed, the effect of an eclipse on humans tends to manifest in different ways and to varying degrees. These effects can be analyzed based on the particular position or placement of luminaries at the time of one’s birth. This is calculated accurately by Sanskrit-based Jyotiṣa-vidyā, which astronomically maps the coordinates of the celestial bodies, including distant star clusters and asterisms, at the time of birth using a dynamic soli-lunar calendar. 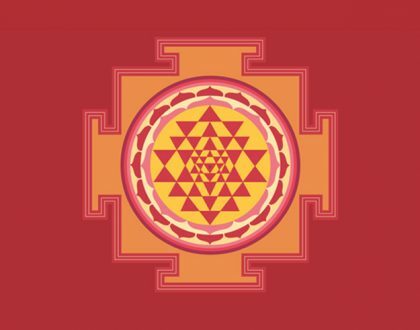 This indigenous knowledge base (gaṇīta-śāstra or Vedic mathematics) is a Vedic Sanskrit heritage that is still practised in India, and while the tradition retains its authentic depth, it is much less prevalent than before. If and how an eclipse affects an individual is a specific and detailed calculation and is in itself a vast subject. As such effects on an individual level are mostly out of our control, they are best mitigated at a personal level by way of contemplation or meditation. Based on Jyotiṣa-vidyā, the effects of an eclipse can last for three to six months if of particular significance to an individual, whereas the effects can last for up to a year if relevant to a country. An eclipse of great magnitude influences life across the entire globe to varying degrees. It impacts in such a way that the effects do not necessarily manifest quickly, but develop over the subsequent months. In the United States we have seen a sequence of severe calamities since the last solar eclipse, compounding an already difficult year affected by warming weather trends and Midwestern drought. The precipitous impact of these calamities has been attributed to the last solar eclipse by the jyotiśa experts (jyotiśvid) who study and follow the effects of eclipses on a country. The onset of natural calamities has been otherwise labelled by such observers as unnatural due to the manner in which these calamities manifest untimely catastrophes. The time period since the major solar eclipse of 21st August 2017 that cast a shadow through the heartland of United States and Puerto Rico has been majorly calamitous. A trio of devastating hurricanes and multiple wildfires all led to a record-breaking year of losses from catastrophes. The very first hurricane sprung up right after this major solar eclipse and caused destruction from flooding that reached a new level of urban tragedy. Experienced eclipse trackers and jyotiśa experts indicated that coastal states, especially those south of the eclipse path, were especially vulnerable from this major once-in-a-century total solar eclipse. Moreover the effects were predicted to linger and could last as late as one year, which is until August 2018. As per the experts, September of 2018 could eventually mark the end of the hard times brought about by such a major solar eclipse. This indicates that we have to be extra prepared with a mindset to face calamities, especially when it comes to eclipse related impact affecting the country as a whole. Since this solar eclipse that spanned the USA from coast to coast, we have had (i) Hurricane Harvey, (ii) Hurricane Maria and (iii) Hurricane Irma, all category-4 storms when they made landfall. Harvey’s devastation was severe due to the historic amount of extreme rainfall causing immense flooding. We are all aware of Maria’s destruction to Puerto Rico’s infrastructure. Lastly, Irma sustained winds of 185 mph for 37 hours, the longest period of high hurricane winds in recorded history. Thereafter the Western Firestorms ravaged California through the year end. The fires in October brought about urban destruction of neighbourhoods on a scale hitherto unknown in California. The combined destruction of the firestorms represents the most costly fire event on record. The largest fire in California’s history, the Thomas fire in Southern California, scorched an area nearly the size of New York City, and is the cause of a rain provoked mudslide that substantially levelled an idyllic seaside hamlet. Even though the fires may not have started due to natural causes, the unusual weather conditions that aggravated the catastrophic impact have been attributed to the energy of the solar eclipse. In essence the experts claim that major eclipses carve out a path of transitional impact that cannot be overlooked. It is noteworthy that Oregon, situated at the entry path of the solar eclipse, was impacted by fires, while South Carolina, situated at the exit point of this eclipse, bore the hurricane impact. Mindfulness and extra care are the call of these times in making our footprint as minimalistic as possible when it comes to our lives impacting the environment. There is however the geological momentum and forces of nature that are verily beyond our control, and all we can do is share positive energy, mindful service and be prepared as best as possible. Whereas eclipses and their effects have been either closely followed or studied by many traditions and cultures, meditators patiently wait for such moments to come forth. This is because the depth and power of meditation increases manifold during an eclipse. An event like this brings an excellent opportunity for enhancing one’s spiritual practice. Regular and persistent practice of meditation can be made to culminate in a new level or the attainment of a special result, a siddhi, from an eclipse. From this perspective, a total eclipse is a greater opportunity to excel in meditation, while a partial eclipse is somewhat less of an opportunity but nevertheless still worthwhile. Seekers in countries where the eclipse is only partially visible can still embrace the meditation practices even though the effects will be milder; however, if the eclipse is not visible at all, the meditation benefits do not multiply. 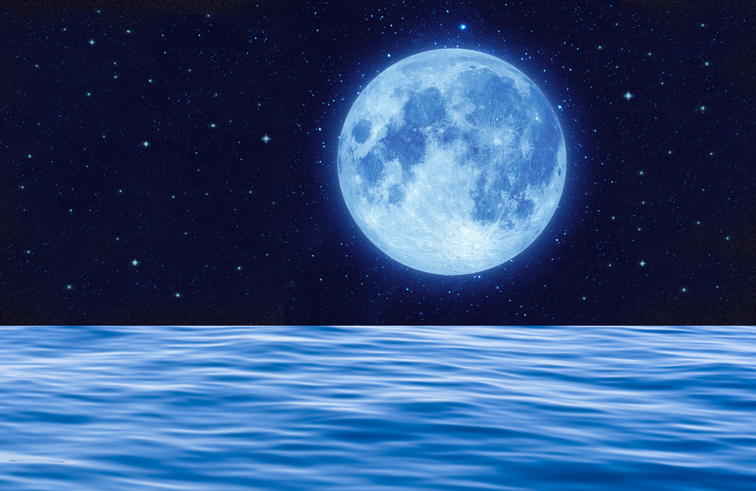 For a meditator to gain the maximum advantage, Sanskrit literature suggests fasting for 9 hours ahead of the start time for a lunar eclipse (and fasting 12 hours in the case of a solar eclipse). This is of course difficult to practise with the modern lifestyle, especially when working during the day. However, some of the other aspects of preparing for an eclipse could perhaps be done, such as fasting during the entire eclipse period and even abstaining from drinking water during the eclipse. One can drink just enough water ahead of time so that the contemplative practices during the eclipse are not interrupted. Those not able to fast can have a light snack well ahead of the eclipse. Food and drinks are not taken during or at the beginning of the eclipse. It is traditional among those who follow the eclipse routine to take a wash (a shower) right before the onset of the eclipse and then take another shower just after the end of the eclipse. 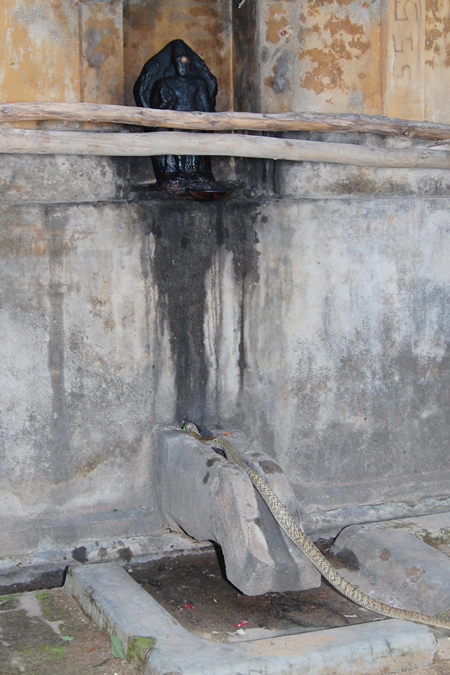 The two showers are associated with two changes of fresh clothes, and is known as a samputi system of locking the energy of the eclipse through a customary cleansing. Taking rest after the second shower would be deemed normal. Fasting can be ended right after this shower and change of clothes. A well-structured pre-planned meditation is usually better practised indoors in a familiar surrounding remaining on one’s own seat of repose (āsana). In this example for Los Angeles mentioned above, the first shower can be taken right at the onset of the umbral eclipse at 3:48am and thereafter the second shower may be soon after 6:08am when the eclipse is no longer visible. Furthermore, maximum intensity of meditation practice can be applied during the total lunar eclipse period of 4:51am to 6:07am. It would be wise to make sure that at least one complete meditation session is done. The peak eclipse is the most intense. Therefore for those planning to meditate during the eclipse or preparing to intensify their existing contemplation, please plan your practice to maximize the overlap with the period of the peak eclipse period. One might need to extend the meditation time by repeating one’s usual meditation techniques a number of times. In that case, repeating a sequence an odd number of times (such as thrice) is better than an even number. However, the depth and quality is more important than mere repetitions. This is a summary of relevant recommendations from the Sanskrit literature. It is best to utilize this rare opportunity to intensify your personal contemplation or meditation practice.